This recipe was inspired by Ree Drummond of Pioneer Woman when I was looking for a new twist on making BBQ chicken for one of our last meals in our apartment. I wanted to make something that would fill the apartment with “yummy smells” and give us a meal that could be eaten for a few days in chicken salad or sandwiches. While I really liked the original recipe, I found it difficult to replicate, possibly because I was using an electric oven instead of a gas range. I also was trying to use up ingredients from my fridge before the move to our new home, so I definitely did some substituting along the way to create something truly finger-linking. Here’s my take… I hope you enjoy! I started with a package of 10 chicken thighs. I preheated the oven to 400 degrees and used a large, high-edged baking pan, drizzled with the last of my olive oil. I placed the thighs, skin-side down, in the pan and liberally topped them with garlic salt and pepper before placing the pan in the oven to roast for 25 minutes. NOTE: I removed the skin from half the thighs to see if there was a marked difference in taste… in the end, I didn’t miss the BBQ’d skin in the least. While the chicken roasted, I made a sauce of 3/4 bottle of BBQ sauce (use what you like), 1/2 jar apple jelly (use whatever preserves you like best – I would have preferred grape or blackberry, but apple jelly was in my fridge, waiting to be finished), a thumb’s length of crushed garlic (the stuff from the tube is fine, unless you want to mince your own… then use 2 cloves or so), 1/2 cup of Chardonnay (I would suggest using your favorite non-oak chardonnay here), and 1/4 cup ketchup. I heated the sauce on the stovetop and kept it warm throughout the cooking process so I could easily brush the meat with the thickened sauce. Once the thighs have roasted for 25 minutes, I brushed them with sauce and flipped them over before liberally brushing sauce on the top. Thus began a series of three “roast for 10 minutes- baste with sauce- pop back in the oven” segments. Since I didn’t really see the crispy BBQ-look I wanted, I then popped the oven temp to 425 degrees and roasted for another 10-15 minutes. I liked that the original recipe didn’t call for any flipping of the chicken thighs, but I did have a lot of extra “juice” that I removed after the second or third “10 minutes in the oven” segment. You can see by the photos that the sauce does get really dark and caramelized as it continues to roast and I do believe that this would have cooked a little quicker in a gas range, but I ended up with the result I wanted and we thoroughly enjoyed every bite! I”ll post the recipe for the accompanying Twice-baked Potatoes with chardonnay as soon as I can…. these are fast becoming a staple in our house, so I really need to share this recipe as well. If you like baked potatoes, crossed with mashed potatoes, crossed with potato skins, you’ll love this easy side-dish. Until then…. enjoy cooking for your family! 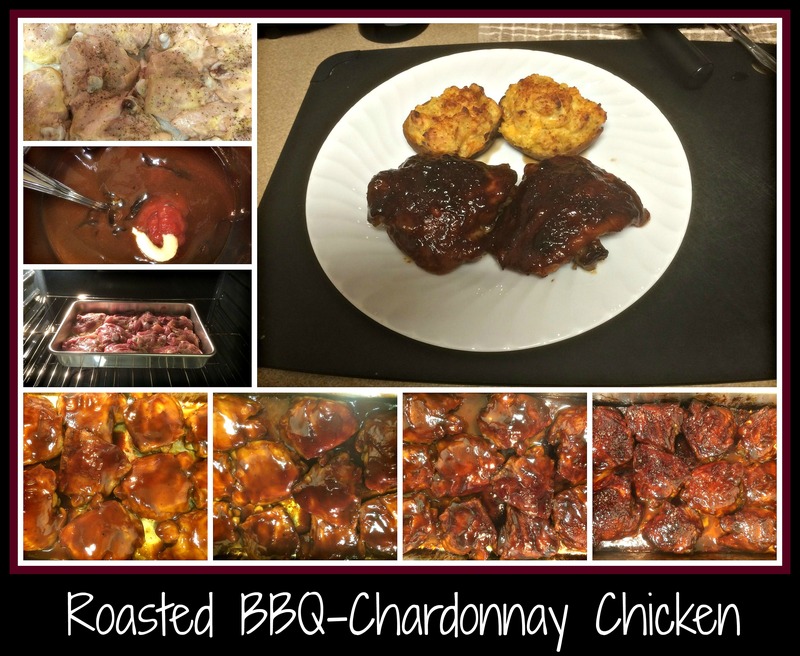 This entry was posted in Cooking, Cooking Challenges, Moving, Recipe, Wine and tagged BBQ, chardonnay, chicken, chicken thighs, easy dinner, easy recipe, white wine.